Personal Checks via Land mail, all donations are tax deductible. If your workplace offers United Way or Community Shares Giving Programs, you can support our grass roots efforts to help homeless dogs/cats with your payroll deduction. Central Ohio United Way: You will not find our name listed with them as their policy does not allow dog/cat rescues unless they have a direct link to helping people. Not all United Way Agencies have this policy, but for any United Way, you can write us in. Community Shares: You can also write us in and we hope to be approved for 2016 giving. Nationwide donates, volunteers & supports us in so many ways. Our volunteers provide homes for these dogs, but we rely on help from our community to continue to meet the medical expenses. A thoughtful way to give and honor a beloved pet or celebrate a friend/family member. Donations made in honor/memory/celebration of will receive a note from Columbus Dog Connection to let them know of your thoughtful gesture. You can send a land mail check or choose credit card options below. 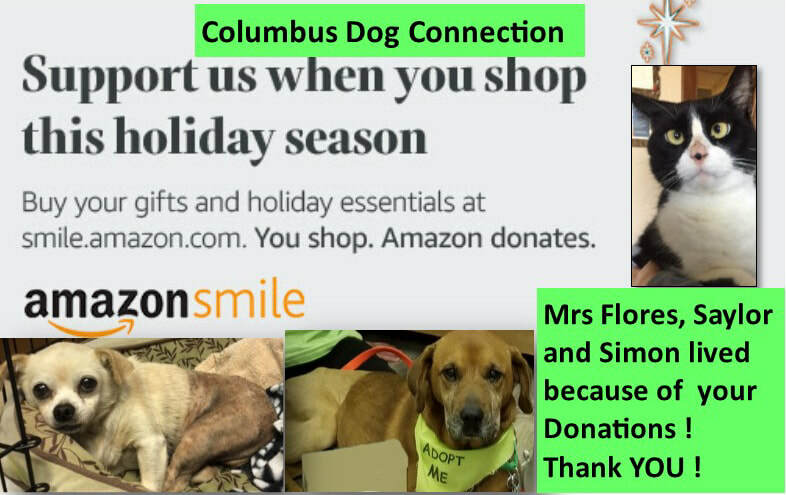 Columbus Dog Connection appreciates the generous support of all our contributors. Not only do they provide support to us throughout their lives, in the form of financial and time commitments, but they also remember our homeless dogs and cats when they plan their estates and create their wills. Please speak with your financial or legal advisor. We will be happy to provide information and work with your adviser or attorney to complete your gift. Contact our attorney who specializes in Estate Planning. Columbus Dog Connection receives a donation with each harness purchased. When you choose Scioto Energy, you will see no change in your monthly service. You will continue to receive one bill from AEP with Scioto Energy charges. And, you still call AEP if your power goes out. Columbus Dog Connection is enrolled in the Kroger Community Rewards Program. Kroger gives us money when you choose our homeless dogs/cats as the beneficiary of your Kroger Rewards Card.